The Garnets seek a sixth straight league title. Absent: Head Coach Mike Bruno. 2018 Record: League champs for fifth straight year. Lost as #1 seed in playoffs to Brewster in second round, 1-0. Captains: Seniors Alex Noga, C; Finn Westerink, 2B/SS. Graduated: “We lost some high-character seniors in captains Jared Olbrys, Gavin Kenny, and Andy Bach as well as Will Davies and Mike Bauso. Returning starters: Pitchers Declan Lavelle and Sean Thompson, both juniors; senior Henry Friedrich, C/OF; juniors Connor Popp, 1B; Aidan Ahearn, OF; C.J. Nemsick, OF. Next game: At John Jay-Cross Rover, Friday, April 5. 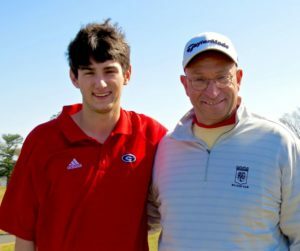 4:30 p.m.
Captain Brian Latkany stands on the green with Coach Romano. Next match: Home to Croton-Harmon, Wednesday, April 10. 3:30 p.m. 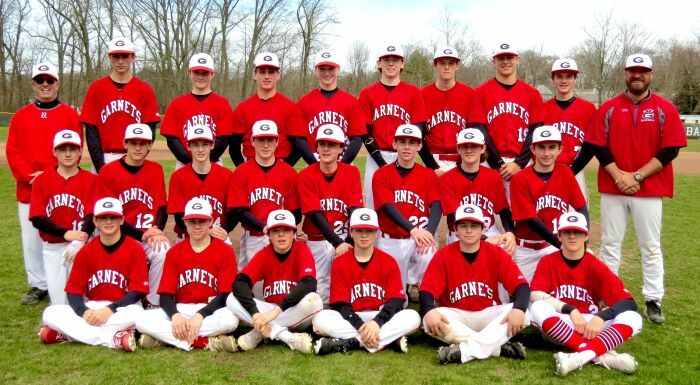 The 2019 Garnets have a lot to prove. Returning starters: “On offense, we have some great returning starters in Tommy Decaro and Sam Poole. We have two other Senior Attackman, Hunter Keller and Danny Fitzgibbons, who will play a major offensive role this year.” New to the varsity: “Sophomore midfielders Jack Bartlett, Caden Whaling, Brendan Kennelly, and Johnny Hartzell will get significant playing time as underclassmen. Hartzell will be taking over faceoff duties from Rye all-time faceoff leader Peter Chabot. What will a successful season depend on? “Our defense will have to play fundamental lacrosse while still putting a ton of pressure on opposing teams. Offensively, we need to score 50% of our goals in transition, on riding, and in unsettled situations. I believe our team is really close as a family this season, and I have not seen such a tight group in a long time. We have been focusing on being better one day at a time, and enjoying ourselves in the process. Last year we had big goals of winning championships, which hasn’t changed. Opening Day: Home to Pleasantville, Saturday, April 6. 11 a.m.
Sue Dickson and her Garnets stand ready to take on a new league. What will it take for the season to be a success? “It’s a rebuilding year for sure, and we moved down to a different league. So, we hope to have some success while playing cross-over matches with powerhouses like Harrison, Mamaroneck, and Byram Hills. Next home match: Versus Blind Brook, Thursday, April 11. 4:15 p.m.